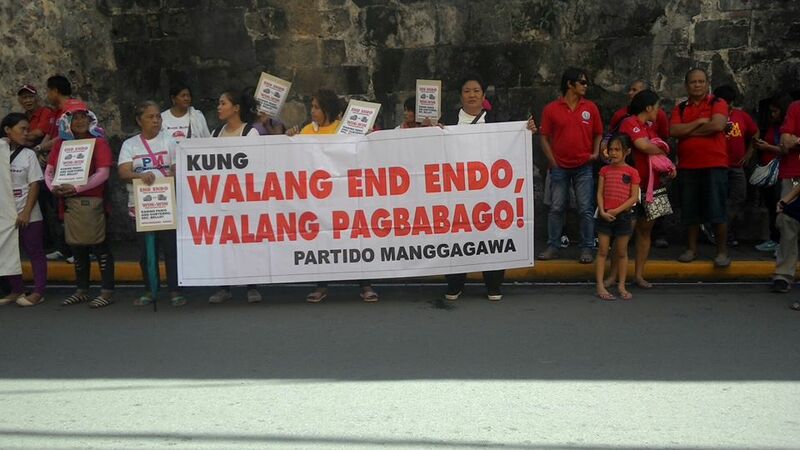 The broken promise of ending endo and the spillover of the war on drugs to trade unionists were the big issues that confronted workers in 2016. Still like the rest of Filipinos, workers bid goodbye to the bad news of 2016 and look forward to good tidings in 2017. A hope for the coming year is the forging of an alliance for real change between millennial students and militant workers. The year seemed to augur well for workers as all the presidential candidates, in a widely televised debate during the election campaign, promised to stop the pernicious practice of contractualization. After his resounding victory, Rodrigo Duterte followed through on that pledge with pronouncements that endo will be abolished and directed the Department of Labor and Employment (DOLE) to ensure this policy shift. The new DOLE Secretary Silvestre Bello announced that a new department order on contractualization will be issued by the end of 2016 after tripartite consultations. Indeed three labor summits were even convened for Luzon, Visayas and Mindanao. However the new draft DOLE DO 30, to replace DO 18-A promulgated under President Benino Aquino III, has been universally condemned by the full spectrum of labor groups, from the moderate to the militant. DO 30 has been soundly rejected by organized labor as continuing rather than prohibiting outsourcing, subcontracting and other forms of contractualization. The ball in now in halls of Malacanang as the labor coalition Nagkaisa has called on DU30 to nix DO 30 and instead uphold his promise of ending endo. Aside from the epic fail of DO 30, another bitter disappointment for workers was the government’s lack of success in resolving the outsourcing dispute at Philippine Airlines (PAL). For months, the DOLE mediated meetings between PAL and the union PALEA on the issue of reinstating 600 employees who have bravely resisted endo at the flag carrier. Yet this December, the DOLE refused to order PAL to enforce a settlement agreement that provides for the re-employment of the PALEA 600. Bello’s DOLE did a Pontius Pilate and ordered that the courts should instead resolve the PAL-PALEA dispute. Meanwhile, as many have feared, the bloody war on drugs finally caught up with ranks of organized labor. In the single month of September, two labor leaders were ambushed vigilante style, six farmers killed and a union officer arrested by police on trumped up drug charges. Just days apart, PM-Cebu leader Orlando Abangan was ambushed on his way home while former union president Edilberto Miralles was gunned down in front of the National Labor Relations Commission. In the heat of preparations for union certification elections, Patricio Tago Jr., a union vice president, was abducted in Tarlac by police and then imprisoned for allegedly being a drug pusher. Calls for tripartite consultations and convening a task force on violent attacks on unionists fell on deaf ears. Various labor groups have blamed the culture of impunity for the spillover of killings onto the ranks of unionists. The groups have called for a stop to the killings and the war on drugs itself. They also point out to the fact that the war on drugs has indiscriminately targeted the poor and unemployed, which comprise practically the 6,000 people killed so far. 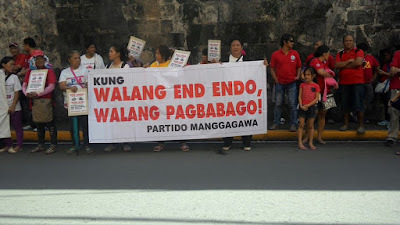 So before the end of the year, increasingly disillusioned over the Duterte administration’s failed promise of ending endo, enacting social reforms like a living wage, and implementing the “change is coming” slogan, militant workers were ready to link up arms with millennial students who took the lead in spontaneous protests against the hero’s burial for the dictator Marcos. Thus barely two weeks after the surprise interment of Marcos at the Libingan ng mga Bayani, labor’s traditional Bonifacio Day marches became an occasion for militant workers to join the #MarcosHindiBayani campaign. Student groups sent delegations to the traditional workers rally in the morning and the labor groups sent contingents to the evening protest at the People Power Monument against the Marcos burial. With 2016 drawing to a close and 2017 about to open, it is time to remember the past even as the people look forward to the future. During the dark days of martial law, it was the student and workers movement that was the backbone of the people’s resistance against the Marcos dictatorship. Martyrs from the ranks of the students, workers and other sectors are the real heroes of our country. Marcos was ousted in a people power uprising but all the succeeding governments failed to topple the structures of injustice and oppression that mired Filipinos in dire poverty. Thus this led to a section of the population prey to the historical revisionism and political ambitions of the Marcoses. Likewise to a mass of Filipinos susceptible to the wiles of a president who insists that the country’s problems can be reduced to drugs and criminality. The present generation of students and workers face the challenge of continuing the unfinished fight of the anti-dictatorship movement for real change.